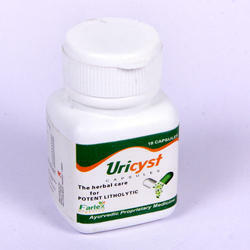 Wholesale Supplier of a wide range of products which include ayurvedic pain relief capsules and ayurvedic kidney stone capsules. Acronac capsules are wonderful ayurvedic joint pain relief supplements which on regular use provide complete relief from stiff and painful joints. These ayurvedic joint pain relief supplements come with herbs which possess powerful properties to curb pain and diffuse swelling to provide relief. Not only this ayurvedic joint pain supplements enhance strength and endurance of joint organs like bones, muscles, tendons, ligaments and cartilages to maintain smooth movement, proper joint alignment and higher pressure and weight bearing capacities of joints. Rumoxil capsules are so effective ayurvedic joint pain relief supplements that these are recommended for people suffering with any type of arthritis to handle painful and stiff joints due to disorder. Acronac capsules possess pain relieving herbs which reduce activity of nerves carrying pain signals to brain to provide relief. These ayurvedic joint pain supplements also possess powerful anti-inflammatory herbs which diffuse swelling and allow smooth flow of blood towards joints to promote movement. Some of the herbs used in these ayurvedic joint pain supplements enhance immunity by supporting production of anti-bodies to fight back bacterial and viral infections and also enhance reach of immune system by improving flow of blood. The main health actions of crataeva nurvala are diuretic, antilithiatic, rubefacient (reddening the skin by producing hyperemia) and anti-inflammatory. Crataeva nurvala is one of the best litholytic herbs (ability to break up stones). Scientific research has indicated that a constituent of varuna, lupeol, deactivates the enzyme glycolate oxidase, reducing the body’s production of oxalates which combine with calcium to form kidney stones.